It has been quite a while since my last post on Poisons and Antidotes, but again, an email from my mother made me think of how important it is to help keep people updated on poisons and ways of fighting them. It is Springtime now, Summer is coming here in less than a month (at least in Europe) and we definitely need to be aware of insects and other sorts of animals that represent a danger for our sensitive organisms. An email my mum got from a friend containing pictures of a wounded man and his escalating injury, due to sting/bite from a Loxosceles reclusa, the brown recluse spider, triggered this informative post. The pictures are impressive, what makes the awareness ever more important. I am summarising in this post valuable information for you to build your knowledge and avoid being caught unprepared to fight back the necrosis caused by the venom of this common spider. The spider responded with legitimacy as a defense mechanism because it may have felt threatened, so don't go out there killing life forms, on the contrary, pretty much every poisonous organism represent a future medicine... so learn how to deal with it and protect yourself. "Recluse spiders avoid areas where there is human activity, and prefer closets, guest rooms, basements, and attics. Outside, they like piles of rocks and leaves." . "The spiders are tan to dark brown and nearly 1/4 (dime) to 1/2 inch (quarter) in body size. The immature spiderlings resemble adults in structure but have somewhat lighter coloration." . "The brown recluse spider is nicknamed the fiddleback or violin spider because of the distinctive dark violin-shaped marking on top of the cephlothoraxfront body section." (see image below, right slide on the bottom). Dapsone, an antibacterial inhibitor of the dihydrofolic acid, is not very recommended for the treatment due to the strong secondary effects, for example hemolysis. 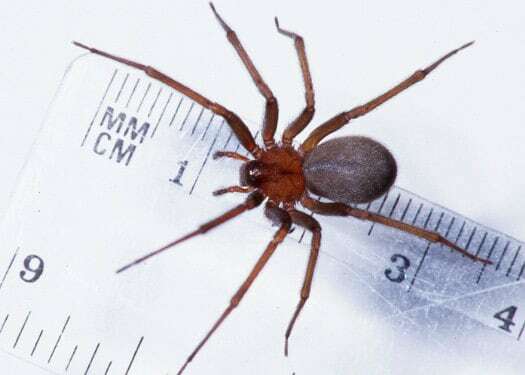 Enthomology and Plant Pathology (University of Oklahoma), [http://entoplp.okstate.edu/ddd/insects/brownrecluse.htm], last accessed on the 02nd of June 2012, last update unknown. 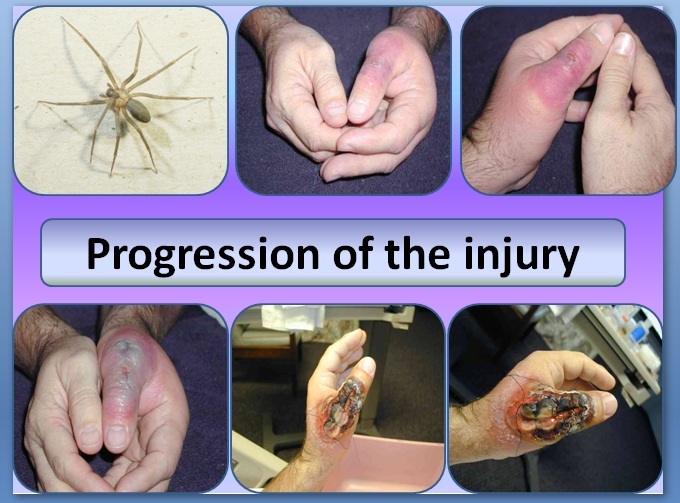 Medscape reference, Brown recluse spider envenomation, [http://emedicine.medscape.com/article/772295-overview#a0104], last access on the 02nd of June 2012, last updated on the 21st of May 2010.
 de Roodt, A. R., Estevez-Ramírez J., Litwin, S., Magaña P., Olvera, A., Alagón, A.. (2007). "Toxicity of two North American Loxosceles (brown recluse spiders) venoms and their neutralization by antivenoms". Clin Toxicol. 45(6), pp. 678-87.